First screened as part of the International Critics Week at the 1968 Cannes Film Festival, Falling Leaves tells the story of Nico, an idealistic young worker, begins work as a technician at a state-run wine collective, alongside his friend Otar. While Otar adapts seamlessly to the rules of the collective, Nico refuses to pretend that bad wine can be bottled. He also falls for Otar’s girl. In this acutely nuanced debut, Iosseliani offers up poignant observations about work, romance and bureaucracy. It is not only a moral tale of an individual resisting oppression, but also a complex meditation on factory life, disappearing rural traditions and Georgian history. In collaboration with the Georgian London Film Festival, Falling Leaves will be followed by a Georgian banquet to mark the centenary of Georgia’s national independence. The Georgia 100 Commemorative Supra will take place in one of London’s leading up and coming restaurants and home of natural wine – Terroirs Trafalgar Square, and will be cooked by some of Georgia’s finest chefs. The evening will take the form of a traditional Georgian Supra with toasting, singing and dancing. As well as the 4 singers from Didgori Ensemble, the traditional role of Tamada (toastmaster) will be taken by the US painter and restaurateur John Wurdeman, who has lived in Georgia since 1996. As co-owner of the winery Pheasant’s Tears, John has been at the forefront of the revival in traditional winemaking in Georgia. 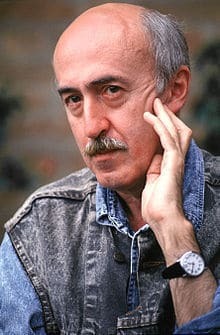 Otar Iosseliani is Georgia’s most celebrated film director and prize winner at Berlin, Venice and a Fipresci prize winner at the Cannes Film Festival for Falling Leaves. A graduate of the Georgian musical conservatory, Iosseliani also studied mathematics, has a passion for poetry, and is an accomplished draftsman. Hypnotic and absorbing, his work lingers on small details – pausing in front of the modest and seemingly irrelevant aspects of humanity to reveal wry wonder at the absurdity of life. If one can find a consistent thread in a career and a personality so multifaceted, it would be his tendency to break rules. Iosseliani’s approach to filmmaking means that he is a complete original.